When we talk about choosing our lines around the track, it’s important to remember that a LOT of variables and information has to go into making those decisions. There’s rarely going to be one set answer for a given section of track. One striking example is going to be looking at the difference between different displacement motorcycles exiting an increasing radius corner (a turn that opens up its radius on the exit). For this example, the red line is going to be our bigger displacement (faster) motorcycle, and the blue line will be a smaller displacement motorcycle which doesn’t accelerate as much. In this instance, both of these riders are taking the “best” line possible here. 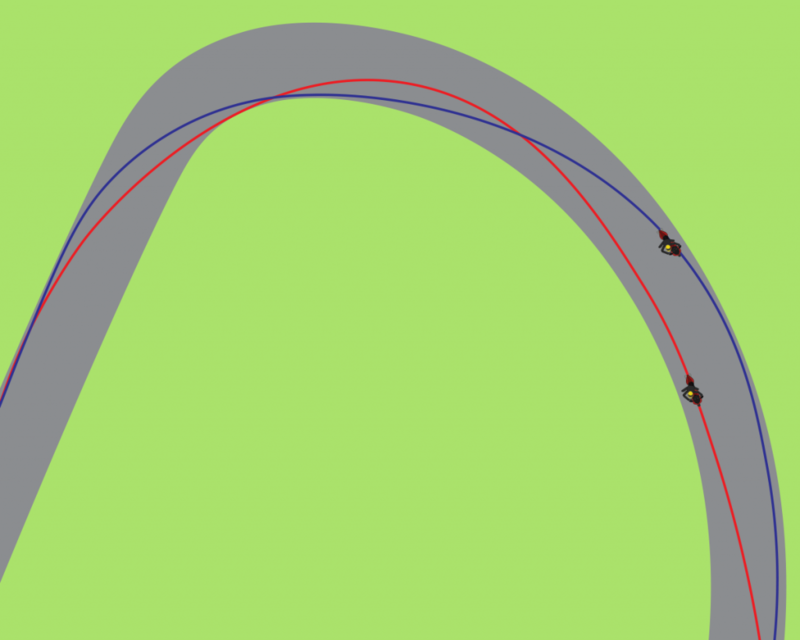 The larger displacement motorcycle is making a much straighter line much earlier, which allows the rider to take away lean angle using some body position techniques as well as just the fact that he’s making a straighter exit out of the turn. On the other hand, our blue line rider is also driving out of the corner with good traction due to his or her lower acceleration rate. They’re able to carry a bit more lean angle with safety, allowing them to roll through the turn a bit more and not have to slow down their speed quite so much in the middle of the turn to tighten up the radius like the larger displacement bike had to. Remember, SPEED = RADIUS. This is just one example – but it’s definitely the most common – of how different riders and motorcycles will have to attack different sections of the track with varied lines. Use the concepts in the next lesson to help make those decisions about which line is the best for your situation. In this lesson we’ll take a look at how speed and safety are interchangeable words, and how the techniques used by the fastest racers can also translate into the safest on track riding. This lesson covers a very basic yet fundamental concept – the corner apex. What it is, where it is and why it’s important.